The gorgeous soundtrack — rare and previously unheard — has been provided for us by Stephen Lyttelton, Humph’s son, and curator of the beautiful and engrossing website devoted to his father. A birthday gift for all Humphrey Lyttelton fans – please pass it on. Humph would have been 94 today and to celebrate here is a free recording never before released. Humph, with Bruce Turner and Roy Williams, was part of the Salute to Satchmo Tour that visited Australia in 1978. Rolling back the years and delving back into the New Orleans catalogue, Humph is joined by a local band called The West Coast Jazzmen from North Freemantle, Australia. The gig was a ‘loosener’ before the main concern the next day and the band let rip with their version of ‘South’. The recording(s) was found on a CDR and restored by David Watson at The Monostery. Please pass on to fans who may not be linked to Humph’s web page or Facebook. 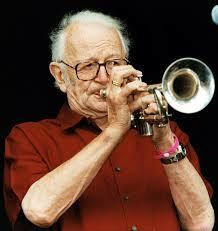 And here‘s the Facebook page for Humphrey Lyttelton 1928-2001. “Like” it! I do. Posted in Bliss!, Generosities, Hotter Than That, Irreplaceable, It's All True, Jazz Titans, Pay Attention!, Swing You Cats!, That Was Fun!, The Heroes Among Us, The Real Thing, The Things We Love, Wow!